Writer/director/producer Tyler Perry makes his first foray into family animation with the release of Tyler Perry's Madea's Tough Love arriving on DVD (plus Digital) and On Demand January 20, 2015 from Lionsgate. The film will be available on Digital HD one week earlier on January 13, and to celebrate, we have an exclusive preview featuring Tyler Perry himself. 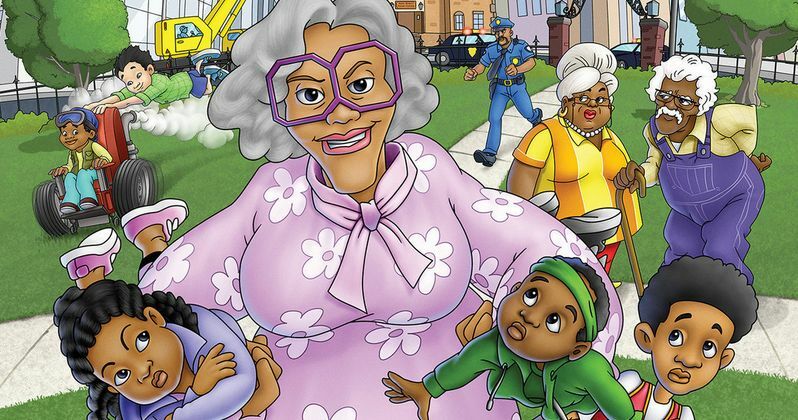 In Tyler Perry's first animated film, fans of Madea can now watch all of their favorite characters including Madea, Uncle Joe and Aunt Bam in a whole new way! The larger than life Madea gets herself into even more over the top and outrageous situations - all in the name of helping children save their youth center. Including a behind-the-scenes look at the making of the film and a sketch-to-screen storyboard comparison that show Tyler in the recording studio voicing his characters, the Tyler Perry's Madea's Tough Love DVD is sure to be a big hit with fans. Check it out as Tyler Perry takes us into the recording studio to bring Madea back to live for this release that is sure to entertain the entire family!